Album This song officially appears on the Let It Be Official album. “For You Blue” is a song by the English rock band the Beatles from their 1970 album Let It Be. The track was written by George Harrison as a love song to his wife, Pattie Boyd. It was also the B-side to the “Long and Winding Road” single, issued in many countries, but not Britain, and was listed with that song when the single topped the US Billboard Hot 100 and Canada’s national chart in June 1970. On the Cash Box Top 100 chart, which measured the US performance of single sides individually, “For You Blue” peaked at number 71. The song is a twelve-bar blues in the country blues style. When writing “For You Blue“, Harrison was partly influenced by his stay with Bob Dylan and the Band in Woodstock over November–December 1968. Whereas that visit had been a musically rewarding experience for Harrison, the Beatles first worked on the song amid an atmosphere of discord, during the filmed rehearsals that made up part of the Let It Be documentary film. Recorded at the group’s Apple Studio in London in late January 1969, the song includes a lap steel guitar part played by John Lennon. Among music critics, some have admired the track for its lighthearted qualities and as a good band performance. Other commentators identify it as an inconsequential song, particularly in relation to some of the Harrison compositions that his bandmates rejected over the Let It Be period. In 1976, Capitol Records included “For You Blue” on the compilation album The Best of George Harrison. An alternative take of the track appeared on the Beatles’ 1996 compilation Anthology 3. A live version recorded during Harrison’s 1974 North American tour received a limited release on the Songs by George Harrison EP in 1988. 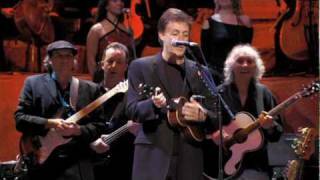 Paul McCartney performed the song at the Concert for George in November 2002, a year after Harrison’s death. “For You Blue” was one of the many new songs that the Beatles rehearsed at Twickenham Film Studios in south-west London, in January 1969. The film project, which became known as Get Back and eventually Let It Be, formed part of the band’s proposed return to live performance for the first time since their 1966 North American tour. Harrison said that after coming back from Woodstock in December 1968, he was “quite optimistic” about the new project, especially the plan to return to a more ensemble-based approach to playing. The rehearsals were filmed and recorded by director Michael Lindsay-Hogg with the intention that the documentary film would accompany a televised concert by the Beatles. Harrison presented an early draft of the song on 7 January, during a day marked by acrimony within the group. In their study of the tapes from the Get Back project, authors Doug Sulpy and Ray Schweighardt write that the Beatles rehearsed “For You Blue” half-heartedly, amid heated discussions about their future and with Harrison in disagreement with McCartney over the proposed concert. Adding to Harrison’s dissatisfaction since the start of the Twickenham rehearsals, his compositions “All Things Must Pass“, “Let It Down” and “Hear Me Lord” had received little enthusiasm from Lennon and McCartney. The Beatles returned to “For You Blue” on 9 January, by which time Harrison had completed the lyrics. He suggested that the song required an acoustic arrangement akin to skiffle or, citing slide guitarist Son House as an example, traditional country blues. The following day, Harrison walked out of the sessions, weary of what he considered to be McCartney’s overbearing attitude and Lennon’s lack of engagement with the project. As a condition of Harrison’s return to the group, the Beatles abandoned the idea of a concert and relocated to their Apple Studio in central London, on 22 January, to record an album of some of the songs rehearsed at Twickenham. Until Lindsay-Hogg chose to include footage relating to “I Me Mine” in the documentary, necessitating a formal recording of that song in January 1970, “For You Blue” was the only Harrison composition recorded for the album. Music critic John Harris remarks on the surprising decision to include “For You Blue“, in light of the more substantial compositions that Harrison had presented. Like Harris, author Elliot Huntley considers that Harrison deliberately refrained from pushing for the inclusion of his best material, believing that his bandmates would not do justice to songs such as “All Things Must Pass“, “Let It Down” and the similarly overlooked “Isn’t It a Pity” and “Something“. The session for “For You Blue” took place at Apple on 25 January, with Glyn Johns and George Martin sharing the role of producer. According to Sulpy and Schweighardt, the band played the song with a “complete focus” that contrasted with their indecisive approach that day when working on McCartney’s “Let It Be” and “Two of Us“. With regard to Harrison’s suggestion for a light acoustic arrangement on “For You Blue“, Sulpy and Schweighardt describe the group’s performance as being closer to the urban blues style. Take 6 was selected as the master take. The recording features Harrison on acoustic guitar and Lennon playing lap steel guitar. Lennon performs the first solo over the instrumental break, after which McCartney plays a piano solo. According to various commentators, Lennon used either a cigarette lighter, a shotgun shell, or the standard slide that came with the Höfner lap steel. To achieve Harrison’s request for a “bad honky tonk piano” sound, McCartney intertwined paper between the strings of the piano. Ringo Starr contributed a drum part that, in Everett’s description, provides a “heavy backbeat” throughout the performance. After the film project was revived in January 1970, for a proposed cinema release under the new title of Let It Be, Harrison chose to re-record his lead vocal for the track. With Johns producing the session, Harrison overdubbed the vocal part at Olympic Sound Studios in south-west London on 8 January. Harrison sings falsetto through much of the song. His ad-libbed comments during the instrumental breaks – including “Go, Johnny, go!” and a reference to Mississippi bluesman Elmore James – originated from this session also. When Phil Spector remixed “For You Blue” for inclusion on the Let It Be album, on 30 March 1970, he added a spoken introduction by Lennon: “Queen says no to pot-smoking FBI members.” This comment was edited in from dialogue recorded at Twickenham Film Studios in early January 1969. Described by Beatles historian Mark Lewisohn as a “most interesting” idea, Spector created a tape loop of the song’s instrumental break over which he inserted other items of dialogue from the film, including contrasting reactions from members of the public to the Beatles’ Apple rooftop concert on 30 January 1969. The tape was possibly intended to help promote Let It Be but never released. Despite Johns’ extensive contribution, Lennon denied him a producer’s credit on the album, which was instead credited to Spector. Apple Records issued Let It Be on 8 May 1970 with “For You Blue” sequenced as the penultimate track, between “The Long and Winding Road” and “Get Back“. The release came four weeks after the Beatles’ break-up and shortly before the premiere of the Let It Be documentary film. The song’s appearance in the film signalled the change of location for the troubled Get Back project, from Twickenham to Apple Studio. The song was selected as the B-side to “The Long and Winding Road“, a single released in the United States on 11 May, but not issued in Britain. In the US, “For You Blue” gained sufficient radio airplay for Billboard to list the two songs together, as a double-sided hit, when the record topped the magazine’s Hot 100 chart. The release was similarly treated as a double A-side when it topped Canada’s singles chart and peaked at number 6 on Australia’s Go-Set national chart. On the US listings compiled by Cash Box, which continued to monitor single-sides individually, “For You Blue” peaked at number 71. “For You Blue” was one of Harrison’s most successful songs on the Billboard charts, both as a member of the Beatles and as a solo artist. In 1976, it was among the seven Beatles tracks that Capitol Records selected for inclusion on the compilation The Best of George Harrison. Recognising that its status as a US chart-topper was due to Billboard’s policy at the time, however, Apple did not include the track on the Beatles’ 1 compilation, released in 2000. The first take of “For You Blue” from the 25 January 1969 session was released on the Beatles’ Anthology 3 compilation in 1996. The edit of the song as used in the Let It Be film – a composite of takes 9 and 6 – was issued as a promotional video for the compilation. A new mix of this film version was included on the Anthology DVD in 2003. That same year, a remix of the original album track, without the introductory dialogue added by Spector, was issued on the album Let It Be… Naked. Among contemporary reviews of Let It Be, Alan Smith of the NME described “For You Blue” as “another strong one from George, a whispery chunky rocker …’Elmore James,’ he calls out at one point, ‘got nothin’ on this baby!’” Melody Maker’s Richard Williams considered it to be “an amusing trifle“, citing Lennon’s “camped-down bottleneck guitar” and the reference to James. Less impressed, John Gabree of High Fidelity magazine found the lap-steel playing the only point of interest on an “otherwise boring” track. In a 2003 review for Mojo, John Harris highlighted “For You Blue” as one of the tracks that remained true to McCartney’s original concept for a “return to the group’s beginnings” with the Get Back project. Harris admired the song’s “mesh of piano, acoustic guitar and lap steel” as “quietly wonderful“. Writing in Acoustic Guitar magazine that same year, David Simons said that, along with other “standout“s such as “Here Comes the Sun” and “I Me Mine“, “For You Blue” exemplified Harrison’s creativity as a rhythm guitarist and introduced a new element to the band’s sound, through the composition’s origins on capo-ed acoustic guitar. Among Beatles biographers, Ian MacDonald dismisses the song as a “forgettable twelve-bar“, while Mark Hertsgaard terms it “a slight blues boogie” and considers that Harrison would have been better served on the album by the superior “All Things Must Pass” and “Let It Down“. Walter Everett writes that the “promise” offered in Harrison’s acoustic guitar introduction remains unfulfilled, such that the principal interest lies in “Lennon’s only lap-steel performance with the Beatles, one that seems both clumsy and polished at the same time“. Ian Inglis welcomes the song’s lightheartedness as evidence that, amid Harrison’s usual preoccupation with spirituality and enlightenment, he was nevertheless able to produce “an uncomplicated and enjoyable love song“. Inglis concludes: “Its directness, and his obvious enjoyment, reinforce the sincerity of his words.” Music journalist Kit O’Toole recognises “For You Blue” as an example of a Beatles B-side that was “just as good, if not better” than the single’s lead side. While remarking on the contrast between the song’s upbeat and optimistic qualities and the tense atmosphere within the band in January 1969, O’Toole likens the performance to “the four sitting in a living room, just jamming for fun“. Like Harris, Justin Gerber of Consequence of Sound considers “For You Blue” to be in keeping with the group’s intended back-to-basics approach, although he pairs it with “I Me Mine” as Harrison compositions that are “not bad, but pale in comparison to his offerings on [the White Album]“. Pitchfork Media’s Mark Richardson admires the song’s “prickly rhythmic drive” and groups it with tracks such as “Two of Us” and “Get Back” as examples of how Let It Be still contains quality material even though “little … feels consequential to the Beatles’ legacy“. [a] stereo 25 Mar 1970 (intro, 30 Mar 1970). UK: Apple PXS 1 and PCS 7096 Let It Be 1970. US: Apple 2832 single 1970, Apple AR 34001 Let It Be 1970. CD: EMI CDP 7 46447 2 Let It Be 1987. “Queen says no to pot-smoking FBI members” was recorded Jan 8 onto the filmmakers’ mono soundtrack tape at Twickenham Film Studios, and it was edited onto the start of the song on March 30. It was omitted on the US single. The Jan 1970 vocal overdub included the spoken words during the solo. The same take does not have the words in the March 1969 mix or the Get Back album. Possibly the entire vocal was re-recorded. 2:23 • Outtake	• B • Stereo	• A good band performance - acoustic guitar (George), slide guitar (John), piano (Paul) and drums (Ringo) - of George Harrison's happy twelve-bar blues. All the recordings of this song were done on the same day, but the version on the album Let It Be featured a lead vocal re-recorded by George on 8 January 1970. 2:28 • Studio version	• A remix of the original album version recorded on 25 January 1969, featuring Harrison's original acoustic guitar performance and overdubbed vocals that were muted on Phil Spector's mix; framing dialogue removed. “For You Blue” has been played in 1 concerts.